The island of Naxos is an island steeped in history, and if you take time out to explore some of its most historical landmarks and monuments from the past, you will find you holiday experienced enriched. 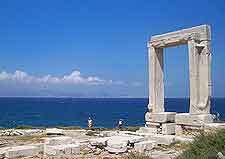 The Portara also goes by the name of the Apollo Temple or 'Great Door' and is amongst the most recognisable of all the ancient landmarks on the island, becoming nothing short of an iconic symbol of Naxos. The interior region of the island is well known for its mountainous landscape, which is home to a series of scenic villages and valleys, each with their very own set of landmarks. 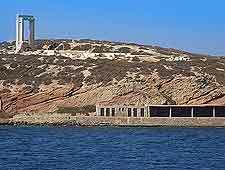 Next to Sangri and within the south-western area of Naxos, Dimitra's Temple (the Temple to Demeter), is one such monument, and is the nearby Bazeos Castle. The Portara is an enormous marble frame and is visible for miles, being particularly prominent around the coastline thanks in no small part to its elevated situation. Built during the 6th century, the Portara gateway is all that remains of the Apollo Temple, which was believed to have stood at more than 30 metres / 100 feet in high. The Portara itself stands some 6 metres / 20 feet high and is around 3.5 metres / 11 feet wide and was originally built with four individual columns, although today, only three remain. Although the climb to the top of the hill is hard going, the remains and views are awesome, and the sunsets are well worth sticking around for. 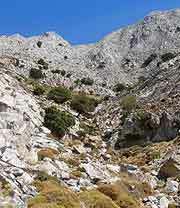 Easily reached from Filoti, the Cave of Zeus stands at the very base of Mount Zeus (Zas) itself, within the Tragaea region of Naxos. This large and dark cave is of great historical significance, being said to have been the actual birthplace of Zeus himself, the Greek king of the gods. Mount Zeus itself forms the highest peak not only on the island, but in the whole of the Cyclades islands, and affords an array of recreational activities, including some popular hiking trails with views to take your breath away. Bazeos Castle is often described as a 'handsome' building and has become a very prominent sight within the landscape. 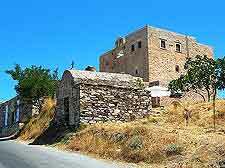 Standing roughly 2 km / 1.5 miles to the east of the village of Sangri, Bazeos Castle started life in the 17th century as the Monastery of Timios, being revamped in true medieval grandeur several centuries later. Each year, various events are staged at the castle, including the ever-popular Naxos Festival each July and August, when concerts, dancing and readings are amongst the main highlights. 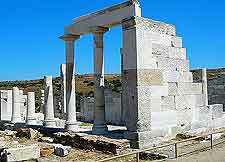 Often referred to as Dimitra's Temple, the Temple to Demeter is one of the most important historical landmarks remaining in this part of Naxos island and can be found just 1.5 km / 1 miles to the south of Sangri. The remains of the Dimitra's Temple are impressive and quite fascinating in their own way, although they are not large by any means. It is well worth coming here just to enjoy the hilltop setting and the subsequent views, while the reconstructions of elements of the temple at the onsite museum may also be of interest. The waterfront of Apollonas is flanked with tavernas and leads towards the beachfront. However, the main sights of interest for many is the enormous 'Kouros', an unfinished statue from the 7th century BC. 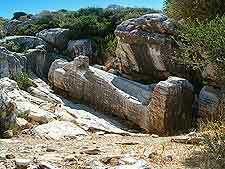 The Naxos Kouros resides within an ancient quarry, which is located on the hillside, directly above Apollonas and close to Melanes. Measuring just over 10 metres / 33 feet and laying down in the exact spot where it was once carved by skilled craftsman, the Kouros statue is quite a sight to behold. It is widely believed that the statue was abandoned after cracks appeared, due to weaknesses in the stone. 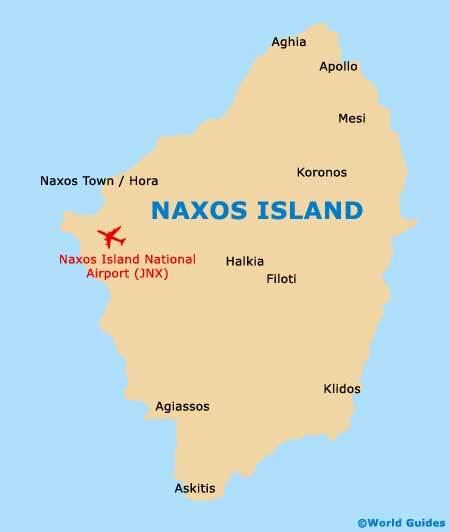 The Kouros statue is easy to find - as you approach Apollonas from Hora, simply follow the signs. The Cheimarros Tower is a historical Hellenistic monument to the past and has recently enjoyed some much-needed restoration work. Standing at around 15 metres / 50 feet in height, the cylindrical stone tower lies to the north-west of Apalyros Castle and is particularly easy to reach from Filoti.